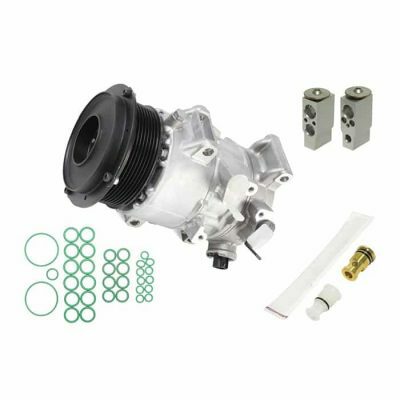 New Aftermarket HVAC Kit replaces Acura TSX A/C Compressors matching OEM #38810-RBB-A01. There is only 1 Compressor type available for the 2004–2008 TSX — HS110R with a 7 Groove Clutch. Still, we ask that you select your Model Year from the dropdown menu above to guarantee the exact fitment. Should you need to verify the exact Year / Make / Model / Trim of your vehicle, please use this Free VIN Decoder. The A/C System is pressurized and should be serviced by an ASE® Certified mechanic. Additionally, the refrigerant (‘Freon’) is an eco-hazardous waste that should be removed from the vehicle with care and recycled to prevent harm to the environment. Draining the Freon via the Schrader valve without using a special machine to recycle it is morally irresponsible and illegal in most areas. SteeringPros.com requires that you follow all factory procedures for replacing the A/C Compressor, Receiver Drier (or Accumulator) and Expansion Device (or Orifice Tube) — which must include a full flush of the A/C System with an approved solvent to remove debris — or the Warranty will be void. 2004–2008 Acura TSX vehicles use approximately 8 ounces of type PAG 46 Oil only. You must also use between 17.60–19.40 ounces of type R-134a refrigerant (‘Freon’) or the Warranty will be void. DO NOT OVERFILL. A: Every product sold by SteeringPros.com includes FREE UPS® Ground + prepaid RS for the Core. Please allow 2–4 business days for delivery. The fee to upgrade the shipping method to UPS® 3-Day Select is $30, UPS® 2-Day Delivery is $60, and UPS® Next Day Air (‘Overnight’) is $90. All orders received by 3:00 PM ET ship same-day. Orders submitted after 3:00 PM will process the following business day (excludes weekends and holidays). If you are having trouble with your order or prefer to purchase by phone, call us at (916) 367–2445. Q: WHERE DO WE SOURCE OUR A/C PRODUCTS? A: Our HVAC Parts are sourced from Ranshu Inc. headquartered in Sparks, Nevada. 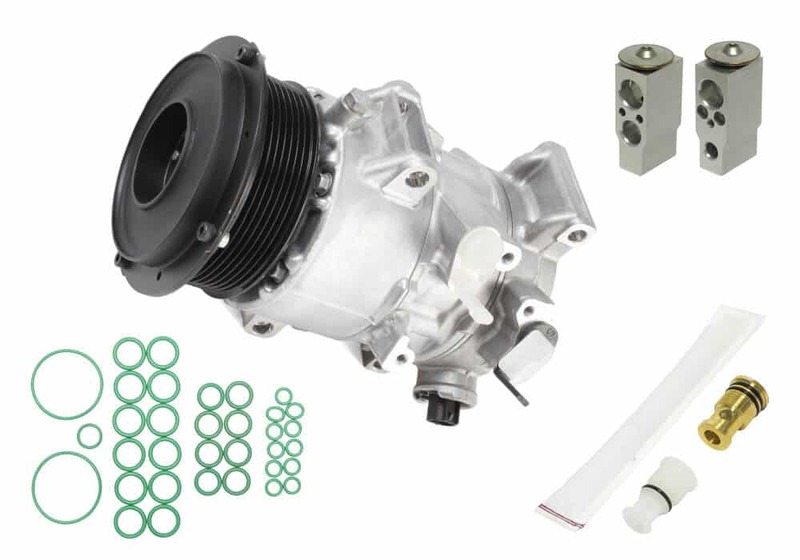 All of our A/C Kits include an OEM-equivalent or Aftermarket Compressor, Receiver Drier (or Accumulator), Expansion Device (or Orifice Tube) and Santech® O-Ring Seal Kit that is identical in fit and quality compared to the Original Equipment (‘OEM’) Part, and meets or exceeds the OEM manufacturer’s specifications. A: 2004–2008 Acura TSX Models use a HS110R / 7 Groove Compressor to pressurize the HVAC System and cool the vehicle’s cabin. While we believe there is only this one Compressor type, please select your Model Year from the dropdown menu above to guarantee the exact fitment. Prior to installing this Part, we strongly recommend that you count the number of grooves and compare to the OEM Compressor. Look closely for any variations or discrepancies. While we make every effort to reduce the occurrences of mislabeled shipments, it is common sense to verify the Parts you receive are exact copies of the original components. Installation of the wrong Part will make the Compressor used and therefore ineligible for a full refund per our Terms & Conditions. Q: WHAT ARE COMMON SYMPTOMS OF A FAILED ACURA TSX A/C COMPRESSOR? Loud Noises — Worn bearings or reed valves may produce a grinding or squeaking sound when the Compressor is turned on. Since the A/C Compressor is driven by the engine’s accessory belt, continued use of a noisy HVAC System is inadvisable and could result in seizure of the Clutch Pulley. Seizure of the Compressor Clutch may lead to extreme pressure on the drive belt, causing it to snap and result in loss of power for other vehicle components like the P/S Pump. High Cabin Temperature — The most obvious sign of trouble is the A/C doesn’t blow as cold as it once did. This may be due to debris or a restriction in the A/C line that prevents the Compressor from operating at normal pressure levels. SteeringPros.com always assumes debris is present in the HVAC System and requires that an approved flush or solvent be used — in addition to the replacement of the Receiver Drier (or Accumulator) at a minimum — to flush out any contaminants or the Warranty will be void. Seized Compressor Clutch — As explained above, the Compressor Clutch Pulley shares the accessory belt with other engine components. If the Clutch Pulley is unable to engage or disengage from engine power and spin freely (and you’ve verified the voltage), you may have a seized Compressor. The Parts included this Kit may not be an adequate fix for your problem, and your mechanic should consider replacing the A/C Condenser as well. If you need the Condenser, please contact our Parts Team for a price quote. Our HVAC Compressor Kits don’t give a lot of fuss—they just perform. Our Aftermarket products are an exact fit compared to the OEM Parts, and we’ve simplified the Checkout process so that you can spend more time focused on the repair and less time online. Simply click the ‘Select Options’ button to choose Model Year and Labor Warranty and Checkout. Orders process same-day if placed by 3:00 PM ET (M-F).